Now that you’ve found the perfect gift for mom, start prepping & planning for a stress-free Mother’s Day. Because for everything they do, every mom needs a break. Let this day be a time to celebrate all the strong women in your life-mom, grandmother, sisters, aunts, friends, and any woman who has influenced your life in the most positive way. Make her feel truly loved & appreciated-beyond the daily reminder. Begin by planning. What does mom love doing the most? Has she mentioned something she loves to do, but never has time to do them? Help her find the time. Does she enjoy getting outdoors- does she like to find challenging hiking trails? Find a new trial for her. Has she mentioned she’d like to spruce up her garden? Surprise her with new plants. Is her pool or hot tub ready for her to enjoy? Get her ready for the season. Next, plan on creating a breakfast or brunch menu centered around her favorite dishes she will truly enjoy. Whether she loves sweet or savory, we’ve gathered some classic breakfast recipes from our BBQ experts to help inspire you to create a delectable menu she won’t forget! John Henry’s “The State Fair Rub”. This versatile seasoning is balanced with sweet salt & course black pepper you can add on anything you get from the State Fair. We suggest adding this to thick cut bacon or any breakfast meat, and adding it to the Mom’s Pellet Grilled Quiche or the Breakfast Sausage Bake! Once you planned out the menu, shop for all the ingredients. Nothing is worse than starting to cook a meal to have to stop to go grocery shopping. Once you gathered all the ingredients, do some prep work. Can you chop veggies or cook something in advance? When you plan ahead not only will it help make the morning run smoothly, but it’ll also show mom you put a lot of work into the day. No matter what you decide to cook, just know you will be the hero-of-the-day when you cooked mom an incredible homemade meal that smells so good it wakes her from a peaceful night’s rest. Make the day extra special by getting the kids involved – can they mix, stir, set the table, or even cook some of the meal with you? After serving up the most incredible Mother’s Day Brunch, enjoy the moment. Slow down, take time to laugh & create more memories. Crazy weekday schedules can make us miss some of life’s smallest moments, which end up being some of our favorite moments. After brunch give mom her special gift, and then let the fun activities you planned for her begin! 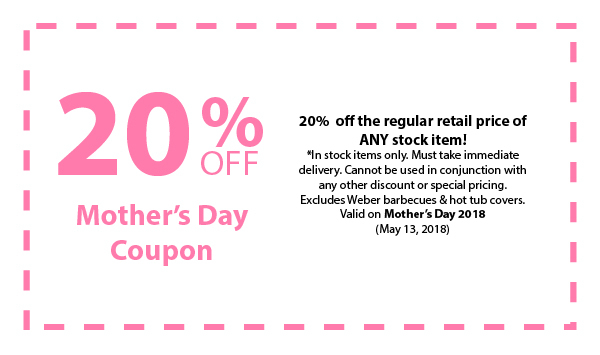 Or if you decided to take her shopping at your local Aqua Quip we are offering a 20% off coupon on Mother’s Day (May 13th, 2018 Only) – some exclusions apply, see store for details. If you take these steps to prep & plan, Mother’s Day will be a guaranteed success! We would like to wish you all a Very Happy Mother’s Day!